That solid green traffic light turns yellow right as your vehicle approaches, presenting to you an age-old driving dilemma: Should you stay or should you go? That decision—whether to slam on your brakes and screech to a halt, or hit the gas and proceed through the light—could very well be the difference between a safe ride to work and a trip to the local emergency room. Our car accident injury attorneys acknowledge: Under the right circumstances, a yellow light is a cautionary signal that saves lives. But because of the lack of nationwide standards and dangerous intersection designs, yellow lights can be also be accident hotspots. 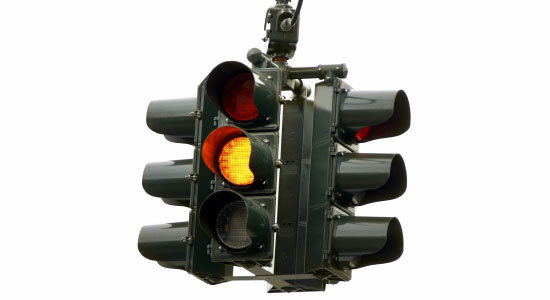 Here's the rule of thumb: If the traffic light changes to yellow, a driver should stop unless it is unsafe to do so. A so-called "dilemma zone," however, emerges when this decision is unclear and the driver doesn't know if it is safer to proceed through the yellow light or to stop and wait for the green signal. In Pennsylvania, more than a third of all traffic accidents happen at intersection—it's clear that this isn't a small problem. According to research, varying speed limits and road designs make yellow-light timings hard to guess for drivers already trying to factor in their driving speed and the distance between cars. The intersection traffic laws that vary wildly from state to state also play a large role in the accident rate. Our recommendation? Always be cautious, and always follow the law. According to Pennsylvania law, "If you are driving toward an intersection and a yellow light appears, slow down and prepare to stop. If you are within the intersection or cannot stop safely before entering the intersection, continue through carefully." We should note, however, what's lawful in Pennsylvania might not be in one of our neighboring states. For example, in some states you must stop at a yellow light as long as it is safe to do so, while other states allow you to be in the intersection during a red light as long as the front of the car passed the stop line before the light switched to red. All of this can be difficult to remember and process while you're already concentrating on basic driving principles. The car accident injury attorneys here at Edgar Snyder & Associates hope that as safety officials in Pennsylvania and beyond identify problem areas, they'll be able to create safer, more consistent intersections so that drivers know the right action to take. In the meantime, remember: It's always best to practice defensive driving—especially when faced with confusing or potentially dangerous situations. We hope you're never in an accident—or cause one—because of confusion over how to proceed at a yellow light. But if you are, please know we are available 24/7 to answer all of your legal questions. Call us today for a free case review. There's never an obligation to use our services, and there's never a fee unless we get money for you.